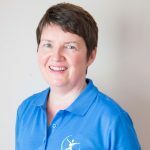 Sligo Kinesiology > Blog > Muscles & Joints > Kinesiologist Fix Yourself! 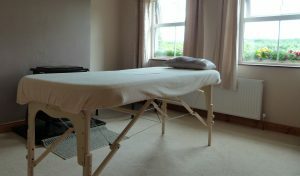 In keeping with the bright sunny weather over the past few weeks I decided to give my therapy room a face lift. I got lovely new curtains to replace the dark red ones on the front windows. As is often the case in decorating when you fix one thing something else shows up. Here it was the dark red paint on the chimney breast which started screaming at the new plush cream curtains. There was no option but to buy a tin of pain a roller and brush and try to tame “Ruby Red” into “Dusky Brown”. After two under-coats the dark red was looking more pinky white so not quite finished yet. For this painting operation I was hopping up on chairs and reaching to the celling and twisting to get at into awkward corners. Next morning I work up with a sharp pain right across my lower back. I couldn’t even bend down to put on my socks. In the past this back pain was a regular visitor. It would arrive like that in the morning and get worse as the day went on. I would be out of action and very sore for a few days at least and painkillers would be called for. Thankfully this is no longer the case. Since discovering Systematic Kinesiology I am able work on myself at the first signs of an ache or pain and prevent it from getting a hold. In our house the proverb “Physician Heal Thyself” has become “Kinesiologist Fix Yourself”. I regularly use my training to fix my back, neck and shoulders at the first niggle of pain or discomfort. It is so much easier to arrest something in the early stages rather than waiting until it gets very painful. To return to my painting story. I spent about 10 minutes using kinesiology to strengthen a weak back supporting muscle which was causing other muscles to tighten and spasm. Afterwards I was able to bend again easily and get back to my work. Later that evening my husband who is at least a foot taller than me declared that I should have asked him to do the high bits! His kind offer did not go to waste. He ended up giving the final coat high and low bits. As a kinesiologist being able to fix myself gives me great reassurance and confidence. It’s quite easy to pull or sprain something when doing housework, gardening or physical exercise. The important thing is not to let a minor injury become a chronic problem. When working with client’s I figure out which muscles are prone to weakness. I then give them simple techniques to use at home should the problem happen again.